We would love you to visit our website, Pegeen.com where we feature over 85 styles for flower girl dresses, ring bearer suits, cotillion, bat mitzvahs, communions and special occasion and everything you see on our website is manufactured by us in our own factory. 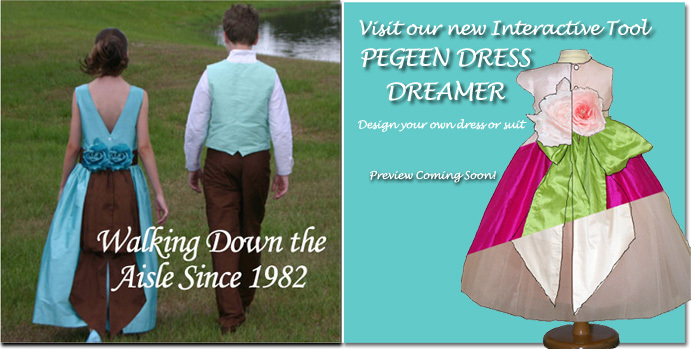 At PEGEEN Children’s Formal Wear we are committed to making your day special. We take special pride in bringing all of our brides into our family. How do we do this? By listening to you and helping you decide the best style which will perfectly compliment your gown or theme for your special day. We feel this strong commitment to helping you has made us grow over the years. Our President literally feels like she is truly walking down the aisle with each and every one of our brides solving crises and helping along the way. Although we are not saints, we do special things for you like notifying you when your flower girl moms place the order so we can take one more responsibility off your shoulders. More than anything, we LOVE what we are doing! Marg Hyland has been designing children’s flower girl dresses and ring bearer suits for the past 30 years. Her company, PEGEEN , one of the first apparel companies with a web site and certainly the first Flower Girl Dress Company online, manufactures her own line of dresses that Ms. Hyland carefully designs. An editor, also a Pegeen customer, writes in her recent article “she knows her stuff”. Not only is each and every flower girl dress design created by Marg but the child’s measurements are carefully gone over by her staff with a sense of perfection to create a perfect fit as if they creating the dress for their own. One of the most satisfying things we stand behind at Pegeen is that we guarantee the fit. For with 30 years brings a depth of knowledge and understanding of the Flower Girl Dress business as well as experience. For a Bride’s wedding, Pegeen is concerned with bringing all the elements the bride has in mind – the mood and theme, the color and style and all the while, Marg explains, it is important to make sure the bride creates something that will appear on her wall for many years to come as the photograph of the wedding party will hang in her home. The more cohesive the look, the more elegant the photo. In the past 30 years, Ms. Hyland has seen markets and fashions change, companies, magazines, trade shows, associations and institutions come and go, and her customers benefit from her experience. Brides-to-be will often call and ask for advice and any of the staff at Pegeen are all too happy to oblige. PEGEEN.com has their phones on from 8 AM to 11 PM. (Summer hours 9-Midnight). Pegeen’s commitment to customer service is such that they will spend as much time on the phone as an anxious bride needs. Pegeen’s tag line “We Care About Your Day” is truly indicative of Marg’s approach, treating each and every customer as if she were her own sister or daughter and sharing in the excitement of planning the big day. Customers appreciate this kind of dialog and it helps make every day fresh and stimulating for Marg and the staff, keeping the creative juices flowing which manifest themselves in the 85 styles for boys and girls in the PEGEEN line. Ms. Hyland continues to reflect her love of tradition and the belief that children should look like children and not smaller versions of grown-ups. This basic styling philosophy has served the company well for the past 30 years and will hopefully continue into the future. Pegeen Children’s Formal Wear was founded in 1982 and designs and manufactures special occasion clothing for weddings and communions. In order to keep prices low, Pegeen does not have a retail store location and is sold exclusively online through their website: PEGEEN.COM. We have been shipping our couture quality flower girl dresses and ring bearer suits all over the world to satisfied customers for over 30 years.